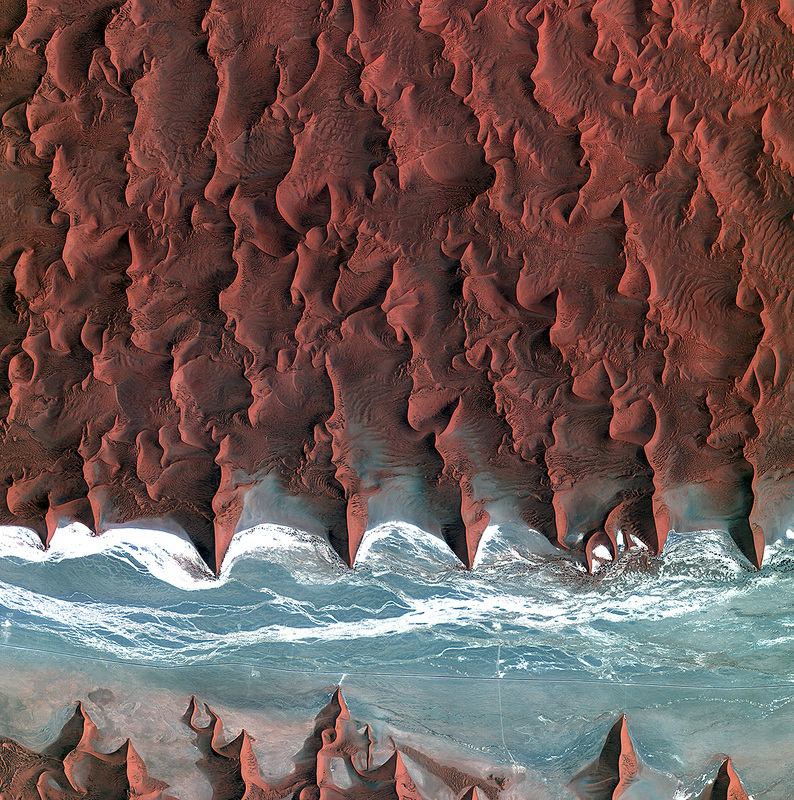 Korea’s Kompsat-2 satellite captured this image over the sand seas of the Namib Desert on 7 January 2012. The blue and white area is the dry river bed of the Tsauchab. Black dots of vegetation are concentrated close to the river’s main route, while salt deposits appear bright white. Running through the river valley, a road connects Sossusvlei to the Sesriem settlement. At the road’s 45th kilometre, seen at the lower-central part of the image, a white path shoots off and ends at a circular parking area at the base of a dune. This is Dune 45, a popular tourist stop on the way to and from Sossusvlei. In this image, there appears to be some shadow on the western side. From this we can deduce that the image was acquired during the late morning. ESA supports Kompsat as a Third Party Mission, meaning it uses its ground infrastructure and expertise to acquire, process and distribute data to users. Posted in Big Picture, Photography | tagged Africa, Earth, Earth from Space, Namib Desert, nature, science, space. The permalink.